I've had some questions about how I made my Dresden Fan blocks. In fact, some friends are going to make them on retreat this Summer. You'll get to see more! The fan blades are cut with a 15 degree ruler. My strip set was cut as follows: white 2 1/2", navy 1 1/4", print 3 3/4". This allows you to get enough blades from one strip set and makes a 13" finished block. 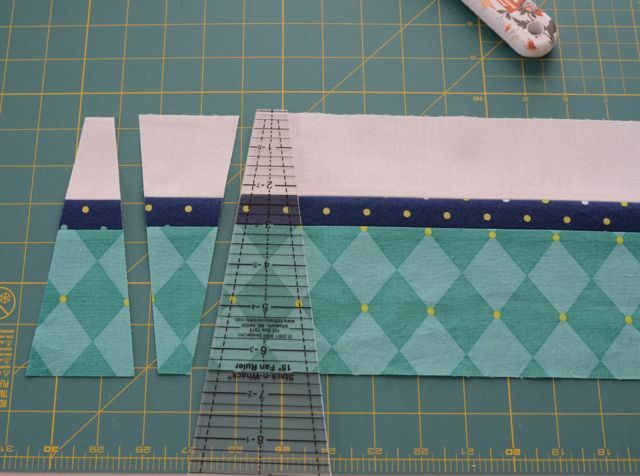 After sewing your strips together as pictured, cut the blades with the ruler, flipping it back and forth. This will give you 12 blades for one block and 12 blades for the second one. I was able to get exactly 24 blades from a strip. Repeat, cutting 24 blades from a 6 1/2" white strip. 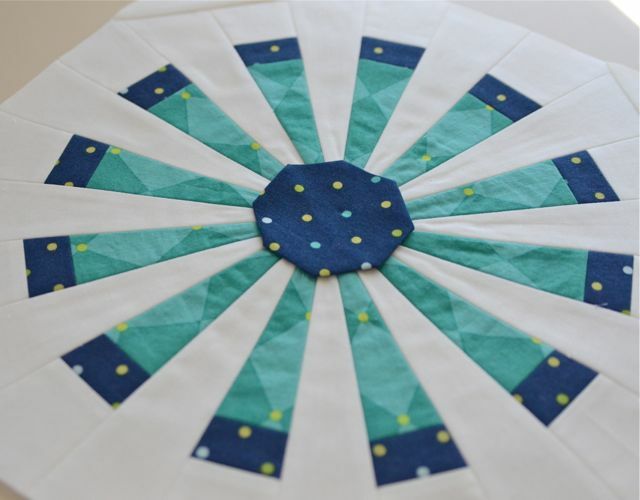 Sew the blades together, alternating the pieced blades and the solid blades. 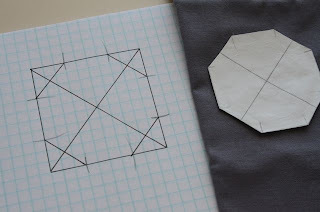 Trim them into octagons following these directions and then into squares following these directions. 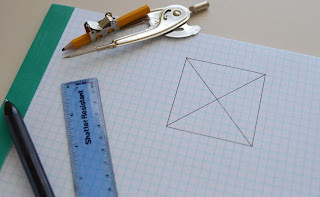 The 2 white squares are 5" and cut once diagonally. These are for the corners and a bit oversized. You can square them up after sewing them to the block. You get a small Dresden and a large Dresden from each strip set. 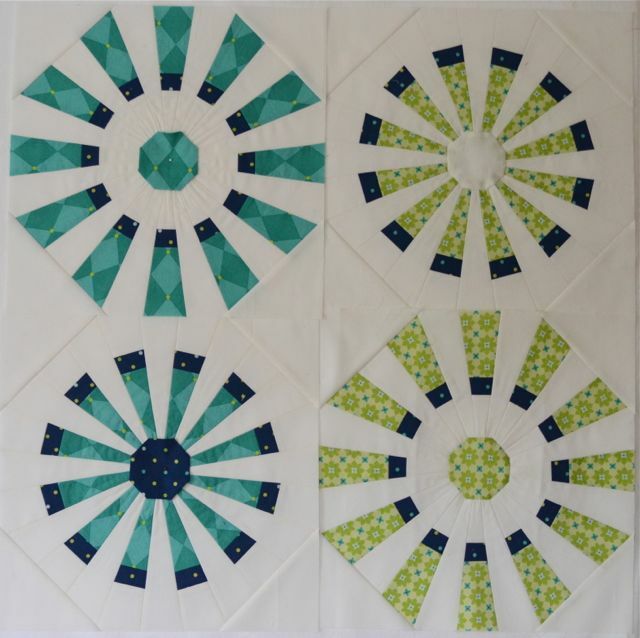 My blocks are 13" finished, but you can easily change the size by adjusting the width of your strips. Just remember if you make them larger you will probably need more than one strip set to get 24 blades. *Note: If you use Fat Quarters, you'll need at least two 20" strips, but you may not get enough blades because there is more waste. You'll likely need 3 strip sets. Draw a square the size of your finished octagon. I made mine 2 1/2". Draw a line from corner to corner in both directions to find the center. 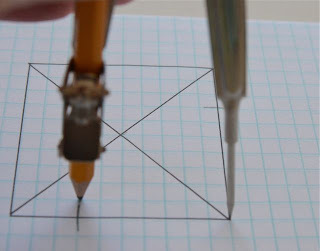 Use a compass and place the point on one corner and the pencil at the center point. 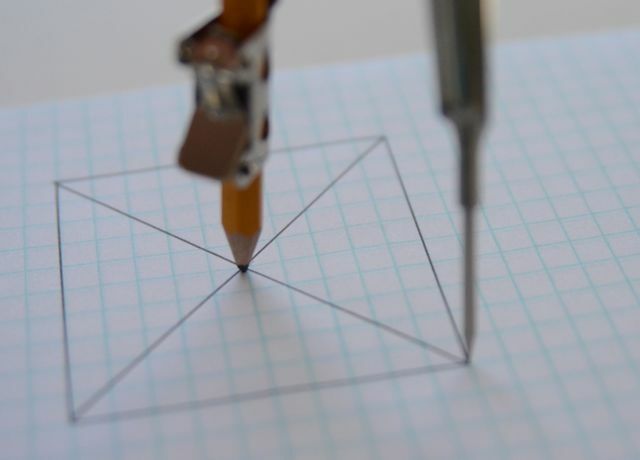 Turn the compass and make a mark on each adjacent side. Repeat from the other three corners. You'll have 2 marks on each side. Connect the marks at each corner. Voila! I then cut my octagon out of a double layer of freezer paper to use as a template. Press the template to the fabric, shiny side down. Cut out the octagon leaving 1/4" seam allowance. Use some starch on the seam allowance and turn it under. Press well. Now it's ready to appliqué to the center! I just love this block and I want to be clear that it is not my design. Geta from Geta's Quilt Studio created this unique Dresden. Thank you, Geta! Cindy, thank you so much for making such great direction and photos for the Dresden block . I am excited to start one , but don't have time till next week. Thanks for the directions for this great looking block, Cindy!! Brilliant tutorial, so clear and concise- added to to do list!! 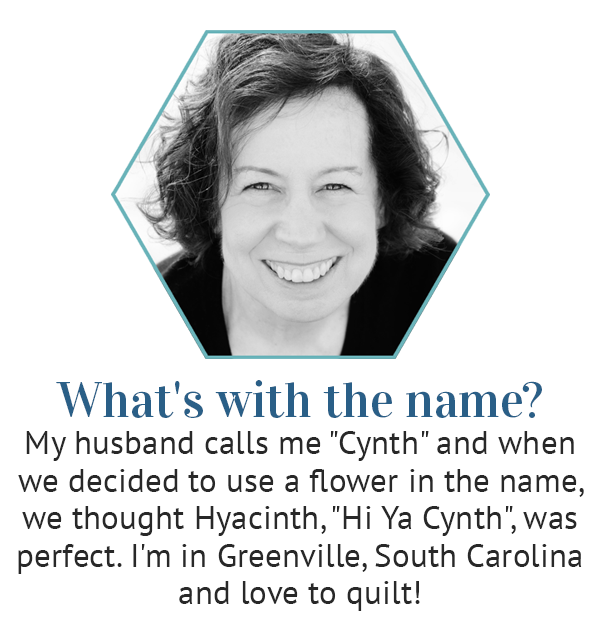 Thank you Cindy for sharing the directions--can't wait to make on retreat and also for showing me Geta's site--she does awesome work too. Love the block! Very unique and modern! Thank you for such a wonderful tutorial. Clear and easy to follow. Thank you for sharing your talents. Excellent, well written directions for a stellar block. Thank you for taking time to share. Cindy, thanks for the directions. can't wait to try it. I just discovered this and I LOVE it!! Thank you!! I have just made one dresden fan efter your directions and it was great fun. It turned out as I hoped. It is very good to use the wedge again bought for the bargello wheel. These dresden fan I will use for a table runner. I have also said thank you to Geta for her tutorials. 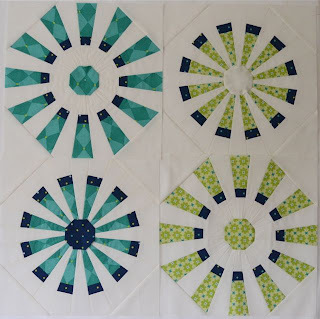 Love this block and your tutorial is wonderful!! Beautiful!!! Thanks for the directions! !